I like collage and have long been interested in knowing where to start but I recently saw a video about it over on Pintangle. 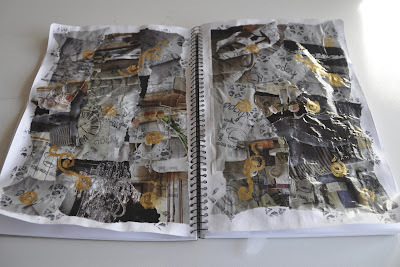 So last Sunday morning, when I had assignments to mark and the house needed tidying up before the family arrived for lunch, I started work on a collage. It hasn't photographed well - and, of course, there's a lot of room for improvement - but I enjoyed the process of tearing and gluing. I didn't do these things when I was young - I had a deprived childhood. One of the things I learned from the video on Pintangle was to turn off my inner critic and just enjoy the process, which I did. And because I did it in my journal, I didn't have to worry about it being a display piece. I enjoyed the process so much, I'm eager to have another go at it - but I have another busy week at work ahead - but I will be finishing up at one of my jobs, so there's hope things might quieten down soon. That looks very messy - and fun! Glad you felt liberated. The gold stamps are nice touch. Thanks for the Pintangle link, I haven't been over there for a while.